Raising monarch butterflies from eggs isn’t rocket science, but a bad raising process can end up hurting the monarchs you hoped you were helping. Here are 21 tips to help bring you more raising success, while helping the monarchs recover from their 90% decline. Keep your monarchs in an environment that brings all the benefits of nature without the dangerous extremes. We keep our caterpillars in a breathable mesh cage in our three-season porch with the windows open. A large % of people that post comments on this blog, ask questions about monarch diseases and how they can cure them. The bad news is, you can’t. The good news is, a proven raising process will largely eliminate the raising conditions that cause monarch disease. 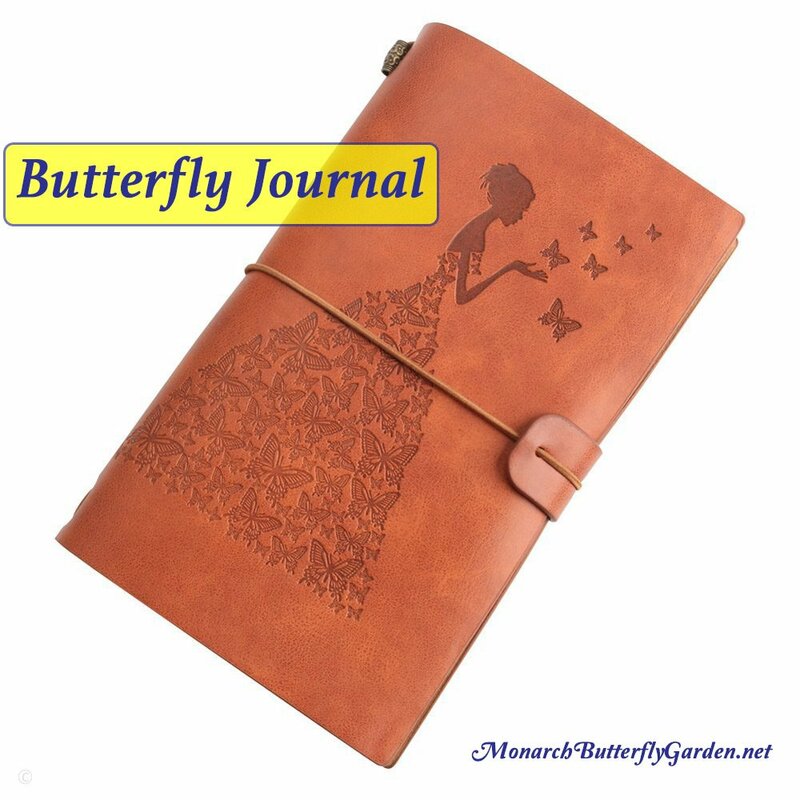 A journal is a great way to reflect on the season and see how you’ve progressed. It’s also a tool you can use to help determine the cause of issues that arise during the raising process. We use breathable mesh cages that keep caterpillars in, and deadly predators out. Most alternatives have holes that baby monarch caterpillars can easily escape from. When a caterpillar hatches it’s less than 1/10″ long, and can slip through most makeshift cages. If a baby caterpillar escapes, it’s like finding a needle in a haystack…maybe worse. Preparation Tip 5- Don’t Mix Cats with Cats…or Dogs! Unfortunately, some of our curious feline friends don’t mix well with butterfly ‘cats’ and could kill the monarchs you’re trying to protect. If you’re lucky, your pet will only sniff them, like our dog does. If your pet is more paws on, make sure your raising cage is out of harm’s way. Butterflies can spread parasites to caterpillars so they shouldn’t be kept in the same cage. 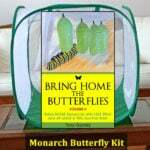 Raise one batch of monarchs at a time and don’t collect more eggs until the last butterfly is released, and your cage has been cleaned. Your other option is to keep two raising cages on hand. Don’t use household cleaners, apply flea treatments, lotion, hairspray, or hand sanitizers around your monarch guests, as these can prove deadly. If you’ve handled these (or similar) items, please wash/dry your hands before handling milkweed or monarchs. Don’t forget to wash after petting a flea treated dog! In its two week life span, one caterpillar can consume an entire milkweed plant. Do yourself a favor and have plenty of milkweed available before you begin. A patch of milkweed should consist of 6-10 mature plants for feeding hungry monarch caterpillars. Grow at least 2-3 different species of milkweed, and grow several patches (and mini-patches of 2-3 plants) around your yard/garden if possible. If you are picking milkweed leaves from another location, find out if they’re being treated with pesticides or are scheduled for a date with the city mower! Large potted plants give hitchhiking predators too many hiding places. 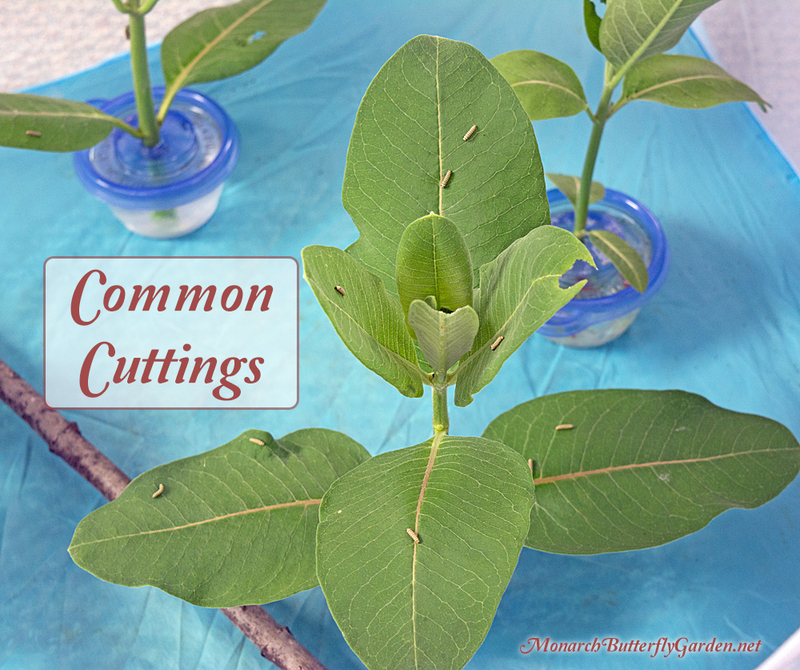 Individual leaves dry out too quickly…but milkweed cuttings make the perfect monarch meal. 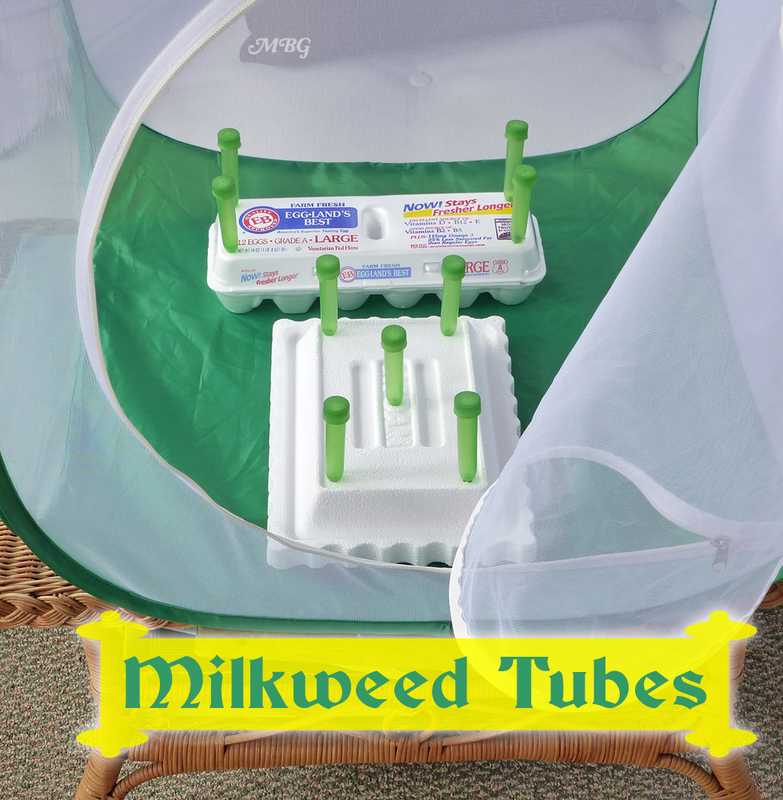 Keep your Milkweed Fresh…for Days! If you’re just learning how to raise monarch butterflies indoors, you haven’t experienced your first milkweed emergency…yet! Milkweed emergencies occur when your heart brings in more eggs/caterpillars than your can milkweed can handle, and you run out of must-have monarch meals. Know your emergency options including nearby parks, neighbors, and nurseries that carry pesticide-free milkweed plants. The sap from milkweed is toxic and can cause corneal damaged if rubbed into your eyes. Always wash your hands after handling milkweed. This is also a good rule of practice before handling monarch caterpillars, in case there’s something on your hands that could be toxic to them or spread disease. You can also greatly decrease the risk of tachinid parisitoids by bringing in small instar 1-2 monarch caterpillars. You can’t save all the monarchs and that shouldn’t be your raising goal if you want to raise healthy monarchs and promote a healthy local ecosystem. Set a goal and once you reach it…stop looking for eggs! 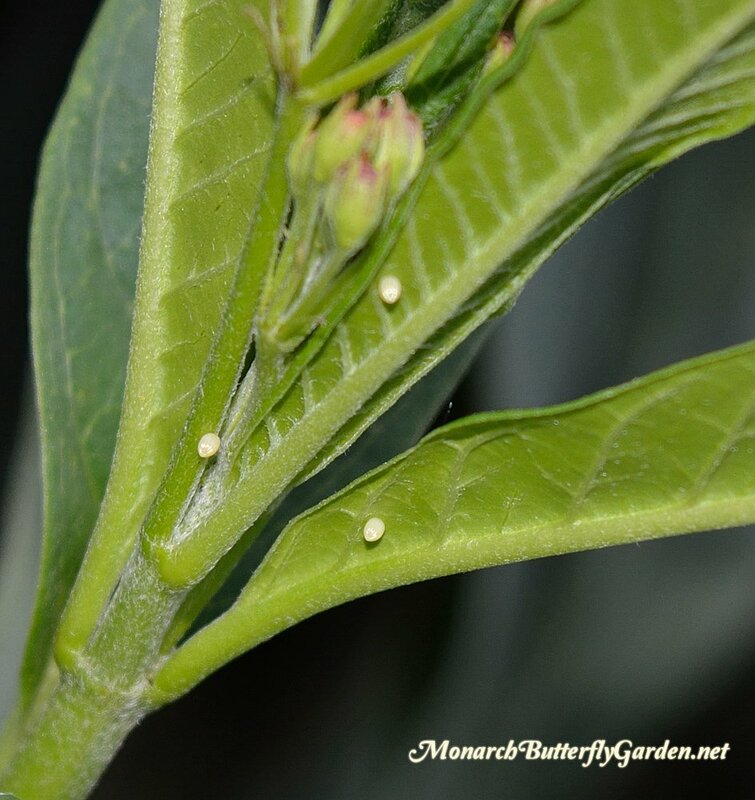 Egg Tip 14- Where to Find Monarch Eggs? Lucky for us, monarchs have one-track minds, and only lay eggs on milkweed plants. Since they are a migratory species, they’ll lay eggs on almost any milkweed variety. Where should you look to find eggs on milkweed? Milkweed should be thoroughly rinsed so that caterpillars food is clean, while providing extra hydration. A mesh cage provides good air circulation so mold shouldn’t be an issue. Don’t put large instar 4-5 caterpillars next to small instar 1-2 caterpillars or the babies could end up becoming part of a milkweed meal. A dirty, frass-filled cage can be the catalyst to spreading disease, so clean regularly. For large caterpillars, you can easily clean up their frass (poop) with a low-power handheld vacuum. Our raising cages are 2ft wide by 2ft long. We can fit about 30 caterpillars in each cage without worrying about crowding them. For 30 caterpillars we would use 6-8 cuttings containers. How many containers you use ultimately depends on the size of each milkweed cutting and size of your monarch caterpillars. Chrysalis Tip 20- Don’t Touch That Chrysalis! Don’t ever try moving a monarch caterpillar that is hanging upside down to form a chrysalis, or has spun a silk pad to hang from. This is arguably the most fragile time in the monarch life cycle. Newborn butterflies must dry their wings 2-3 hours before they’re released. Otherwise, they’ll be defenseless against predators and/or territorial monarch males. In fact, monarch males are notorious for snatching new females for mating before their wings are dry! Sun dry butterflies outside in a mesh enclosure to energize monarchs for release. 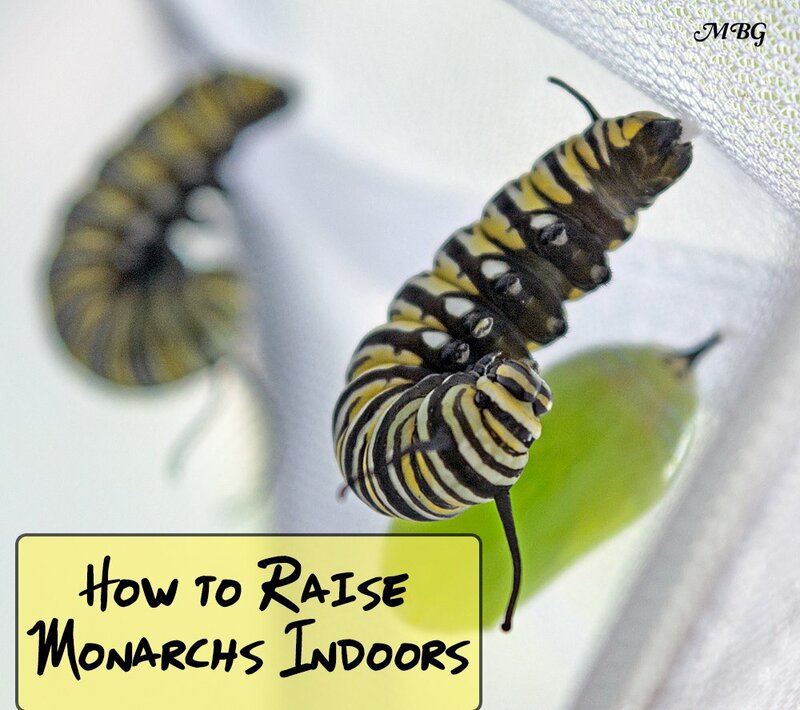 If you want to learn the exact process I use to raise monarchs indoors with a 95% survival rate, check out my how to raise monarch butterflies book so you can have more success raising healthy monarch butterflies this season….Happy Raising! Please Read the Comments Section below for more Helpful Tips on Raising Monarch Butterflies. I’ve just had two monarch butterflies hatch that appear to be ill. One has a bend in it’s wings and the other looks normal but doesn’t seem able to fly. Any info or advice would be appreciated. Hi Tony, I have a problem. I was moving a chrysalis and the stem broke! I don’t know how to hang it now. I have tried tape, it doesn’t stick to top of the chrysalis, neither does glue. There is not enough stem to tie string to or to put pin through. Help! I don’t want butterfly to come out and not be able to dry right. I should have about four days more before it comes out. I have caterpillars eating the milkweed now (Sep 25th), I was wondering if it is too late in the year for them to develop into butterflies and migrate. I live on Long Island, NY. The weather is getting up to 65-70 degrees day and mid 50s at night. I have always planted a butterfly garden but I am only learning about Monarchs now (lifecycle, migration, ect). The caterpillars are pretty large, would it be possible to raise them indoors or should I leave them alone and let nature take its course. Thanks, I will be doing much more research on these guys! I now have 2 monarchs (one hatched yesterday, one this morning, 9/30) and am in CT where its supposed to rain for the next 3-4 days and todays temp is 55. How long can I keep them inside? Can I put them in the same “cage”? I only have one container large enough for them to roam a bit. First one is in there now, the one that hatched today is still in a small container and is trying to stretch her wings…. I live in the state of Iowa, where a few native milkweeds survive in the ditches each winter. Last year I harvested seeds that grew a block from my home, and planted them in my vegetable box garden after all the old plants were removecd and the soil was ready for the winter months of dormancy. All of the milkweeds came up in the early spring and grew nicely. I watched them until September, and then found two Monarch caterpillars on a couple of the plants. I brought them in, with a good supply of milkweed leaves, and put them into a gallon jar with cheesecloth over the opening. The two caterpillars were quite advanced already, so they pupated in two days. They are now hanging on twigs in the jar, which I keep in my kitchen on a small table where they can get light – and even now we are having high humidity and still finding fresh milkweed, which is no longer needed. The caterpillars are to emerge about 4 days, if all goes well. We are almost devoid of flowers outside now..t hey are dying off and have little pollen at all. I am concerned about releasing these two Monarchs in late September into an area with little to offer for food. The daytime t emps are still around 60 – 70 degrees and night temps around 50 – 60 degrees. How can I make certain that these butterflies survive at this time of year ? And if they are the 9th generation, will they have time to migrate to their so uthern destination? We are happy to see these two ” survivors” of modern Iowa farming practices…and if this is successful, I will plant more seeds in November for next year. This is my first time at raising Monarchs inside the house. PS we do have a species of predatory w asp, which is very tiny, that ate the caterpillars that hatched in my garden the year before (2015). What can I do to keep them away next year? I definitely cannot use pesticides of any kind! Thank you…. Thank you so much, Tony, for your reply to my first comment. Just wanted to let you know that my two Monarchs both remerged from their chrysalis earl y this morning. Both are drying their wings at this point, and hopefully I will be able to release them this afternoon. I have decided to release them onto a potted blooming plant that is still putting out flowers, which will be placed close to a bed of red petunias, which is also putting out flowers and lots of pollen. The only competition may be hummingbirds that are migrating in large numbers, but which do not eat insects (to my knowledge) like large butterflies. Our weather is supposed to be warm all of next week, so hopefully the Monarchs will do well. Since these are possibly from the last generation for this year, can I assume that they are the “9th generation” that will migrate so uth to breed and then return to lay eggs in the spring of 2017? If so, I may try tagging them with my initials and the year to see if t hey return . If they do ret urn, will I possibly find them somewhere in my yard later,, assuming that they come back to where they hatched. Do they do this, like the birds do ? So many questions, and I do appreciate your patient replies to my them! Hi Mary, the butterflies that return from Mexico will return to the deep south and most won’t make it further north…you very well could see their children though! Remember, it’s not the same monarchs that migrate to Mexico each season, but their descendants…somehow they know where to go. Some markers have been shown to damage butterfly wings so I wouldn’t mark them. Great website. I have a question, I’m in the process of raising a monarch caterpillar indoors right now. It started to pupate about 7 days ago. I noticed that the chrysalis is very small. It’s only about 3.175 cm maybe even less. Is this normal? I’m worried that it might not make it for its long journey to Mexico. I’m up here in Toronto, Canada. It’s starting to turn translucent I can vaguely make out the black and yellow pattern inside the chrysalis. Did I do something wrong? Like not feeding it enough milkweed? I had it inside a large glass jar during its fifth instar. Kept a good supply of fresh milkweed leaves from my garden. This would be my first attempt at raising a monarch indoors. Fingers crossed. Chrysalis Problems + normal development Hopefully your first monarch will emerge soon. good luck! I, too, had a seemingly small chrysalis. I brought in a 5th instar caterpillar a couple weeks ago for my kids to watch. It was smaller than others I had seen, but was the last one on my milkweed. I had to handle the cat, and it curled up into a protective circle, like a grub for a couple hours. It didn’t eat any milkweed we provided in the cage. It pupated 24-36 hours later into a smallish chrysalis. Like you, I was concerned, and thought the handling may have disrupted the feeding. This morning, a large female monarch emerged. She’s drying her wings, and then we’ll release her. So, even if the chrysalis seems too small for a large butterfly to develop, all may not be lost. They use that small space very efficiently! I’ve been watching a monarch chrysalis that was hanging from the bottom row of siding on my house. Today when my husband mowed the lawn, it fell. I’ve tied thin thread from the black stalk part of the hardened chrysalis and have it hanging from a branch in my home. It’s not enclosed, is that a mistake? I plan on taking it outside shortly before it hatches and retieing it to a tree branch. Hi Amanda, I would let the butterfly dry for a couple hours before tasking it back outside. Otherwise, it will be vulnerable to predators. good luck! What you do is get a small snack container, like the kind you put in your kid’s lunches to hold Goldfish or jelly beans. Then, get some mesh net fabric from a craft store. Make sure the holes are big enough for your escapee to crawl through! Simply put the milkweed in the snack container, rubber-band the fabric on top, and set out your trap, checking it every couple hours. Hopefully, the caterpillar will crawl back and hang around long enough for you to find him or her. And this way, your cat (or dog) can’t get either the caterpillar or the milkweed. Thank you for having this very informative site. I discovered 2 monarch caterpillars last weekend on a small narrow leaf milkweed plant that I have growing in a pot in the backyard. The were already in their 5th instar! Very plump and healthy looking. To protect them from predators or any danger, we covered the entire plant with the caterpillars with a soft fine mesh fabric that let in air and light, tucking the fabric under the plant pot. The only issue were the little pesky aphids that were on some of the leaves. The caterpillars morphed into chrysalises within a few days, smaller than the chrysalises of monarch caterpillars I raised to butterflies about 10 years ago. Because it’s been windy and foggy for most of the days this past week, here in the Bay Area, we relocated the chrysalises to a large round pop up mesh laundry hamper. It was easy to relocate them because, since the caterpillars had attached themselves to the mesh fabric over the plant, we simply cut large pieces out of the fabric around the chrysalises, then clipped the top edge of the fabric pieces to the inside of the top edge of the mesh hamper. So the chrysalises had minimum disturbance, and are hanging in the same vertical position. My question for you : we have the chrysalises in the mesh hamper on a small table in our little front entrance lobby. It gets filtered light all day because the front door there is made of glass panes in a wooden frame. It also gets good air circulation because air comes in through the space between the door and the floor. We turn on the lobby light at night for security reasons, so at night we cover the top of the mesh hamper, and most of the sides, except where it faces the wall with a black cotton sheet, to keep it darker in there for the chrysalises. Is it okay for the chrysalises if the room isn’t completely dark at night? Also, the chrysalises are only about 3/4 inch in length, so quite small. Is it possibly because they are female? They certainly had a good food supply of fresh growing milkweed. Great news – our chrysalises eclosed today! Before I left for work I checked the chrysalises and saw that that they were almost black, with the distinctive monarch colors showing through. I knew that today would be the day. Since I was going to be gone until evening I cut a small slice of watermelon and put it on a paper towel at the bottom of the mesh hamper, and clipped two fresh zinnia flowers with long stalks to hang diagonally in the hamper. When I got home 10 1/2 hours later, there they were, 2 beautiful monarchs hanging from the top of the hamper. Now and then they flexed their wings. I boiled some sugar water, like I do for our hummingbird feeder and will soak some cotton balls in the nectar for the monarchs tomorrow morning. Then I hope to release them in the backyard near our zinnia plants once the sun is out, probably late morning. Thank you so much for your site! Hi everyone from New Zealand! I’ve raised over 100 butterflies this year – the season went on longer than I’ve had before as it’s been so warm. So much so that we’re just about to hit winter (June 1 is tomorrow) and I still have caterpillars on swan plants. I’ve brought them inside today as it is getting chillier. Should I release them outside though when they hatch …even though it’s winter? The Beautiful Monarch good luck! Thanks Tony. I love your site – it’s full of fabulously helpful information! I’m very, very new to this. Last fall I ordered some milkweed. They did horribly, died…and a few came back with sparse leaves. I still tried to get them healthy, but they’ve continued to grow poorly. That all being said, two weeks ago I saw a little larvae on one of my few leaves. I was shocked and happy…brought him inside and read everything I could on raising them. The cat was probably Instar #2. 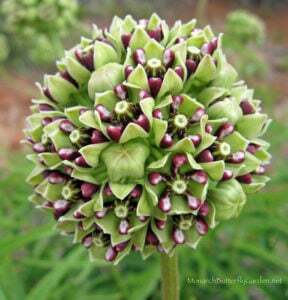 The plant he was on was either Ascleplas specious a (Showy Milkweed) or Indian Milkweed. Again neither plant could sustain a cat for long, hardly any leaves. So I went and bought 4 new plants, but they are a different variety, Asclepia 1….it looks different than the others. Here’s my question. Do you have to feed it the exact same milkweed, it definitely seems to prefer the one I found it on….but it has no choice but to eat the ones I purchased. And today I went out and found another Instar #2…I was shocked…they’re can’t be more than three leaves on the plant. I brought this one inside also..and I’ve separated them, as the large one looks like he’s ready to stop eating and start the chrysalis process. Should I worry about getting new plants. Thanks for all of the information I’ve gotten off your site. Hi Cin, congrats on finding two caterpillars. It sounds like your milkweed isn’t very happy where it was planted…you might try planting some in a different microclimate of you yard and see if it thrives in different growing conditions. Perhaps try growing a couple more species and talk to local gardeners to see what works best for them…good luck! After losing lots of caterpillars and crysallis to various causes last year, I set up a habitat in a mesh cage this year. Things were going well, but 2 of my first 6 cats going to the “J” didn’t fully emerge from their skins. The skin split open at the bottom to show the bright green, but didn’t continue any further, and eventually died. Didn’t see this at all last year. Hi Richard, if they weren’t parasitized by tachinid flies (you’d see maggots/pupae on the cage floor) dying during pupation is a common sign of pesticide exposure. Wow, this is the first year I have Generation 1 monarchs! An ELF found my milkweed patch a couple weeks ago and laid 6 eggs before a thunderstorm chased her off. All hatched and I have 6 happy cats. One thing I learned last year was to keep eggs separate from each other because not only did the hatchlings eat their egg shell, but some wandered away and ate their neighbor’s egg shell—with neighbor still in it. 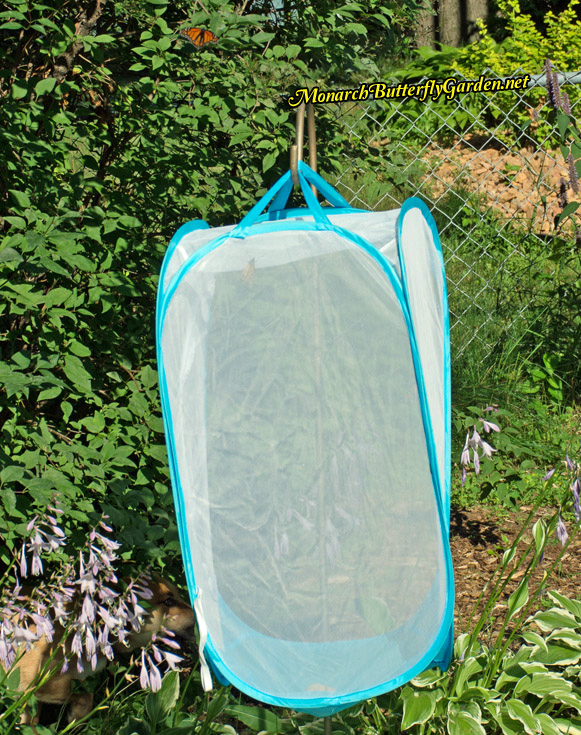 Thanks so much for your awesome pdf on how to raise Monarch Butterflies. I ordered the Monarch Butterfly Kit and a second big cube back in February. Around January 30th, I was surprised to find that the Monarch butterflies were laying eggs on my native milkweed plants, Asclepius Perennis, that I was nursing along in pots on the front porch (Ocala, Florida) before putting the plants out in the backyard. I wasn’t planning on raising butterflies. I definitely had a milkweed shortage. With the help of a new found friend, whose neighbor had a nice patch of tropical milkweed in her yard, I was able to raise and release 28 lovely, healthy Monarch butterflies out of 8 eggs and 25 caterpillars by March 14. I am so grateful for the supplies and information you put together so well in the kit. I highly recommend it for anyone who wants to get the best start possible in this exciting contribution to the planet. Hi Janice, I’m so excited to hear of your success, and glad you found the cage/guide helpful in your raising journey. I’m glad you were able to find help during your “milkweed emergency”…one of the most stressful parts of raising is running out of milkweed. Hooray for new friends and their neighbors! Since April 8 I’ve had 56 butterflies emerge. 53 have been healthy, but unfortunately the last 3 have been unable to fly and have died with in a day or two of emerging. Any idea what could be causing this? Should I be worried about the rest of my “herd”? Thank you as always for your wisdom. Another issue just came up. I just looked and I had a J-stage caterpillar oozing a clear liquid. I have separated him out and cleaned the cage the best I could with so many cats and chrysalis hanging in the cage. He is not discolored. No other signs that something is wrong. Should I euthanize? Will my other caterpillars get sick? I took my other large enclosure to my son’s school and lent my smaller one to a friend so I don’t have a lot of options to separate out the remaining 4/5 instar caterpillars that are in the cage, but can certainly put them in a smaller container and feed them cuttings from the yard and move the 19 chrysalises to another location as well if you think that would be best to clean the cage immediately and change the food source out. Thanks for your advice. Sorry for all the questions. You’re the only guy that writes back. Good news! The oozing caterpillar turned into a beautiful butterfly! So glad, I went with the wait and see approach. Doing great thus far. 6 healthy butterflies to date, 26 chrysalies, and 20 additional 4/5 instar caterpillars! I stopped collecting eggs till I catch up so don’t have any smaller ones. I also have abou 150 Native and Tropical milkweed seeds germinating successfully so I’ll have a better food source for future generations. I’ve had 2 chyrsalises not eclose which was difficult, but not as difficult as what I experienced this morning. I just had a beautiful butterfly eclose, but sadly he has a horribly deformed proboscis. Both pieces are yellow and one side is completely hard and straight. At first I thought something was stuck to him, but then I realized what it actually was. I don’t see how this little guy will ever be able to eat even though I think he will be able to fly. Hi Joanne, if it doesn’t look like the butterfly is going to be able to take in nectar I would probably euthanize. It’s hard to say without seeing the butterfly, but doesn’t sound good from your explanation. I have a monarch caterpillar that has attached itself onto the side of my net enclosure and is in the J-hook position. Is there anything I can do to move it, so it has more room to turn into a chrysalis? I’m afraid it’s not going to be able to fully turn into one. Thank you. Hi Sheralyn, I would wait to move it until after the chrysalis has formed and hardened (24 hours after) good luck! But will it be able to turn into a chrysalis when it’s hanging from the side of the netting and not the top of the netting? Hi Sheralyn, it will have to. If the caterpillar didn’t climb to the top to pupate, there may be something wrong with it. All you can do at this point is monitor, and move it after the chrysalis hardens. good luck! I’d like to know if the butterfly eclosed normally? 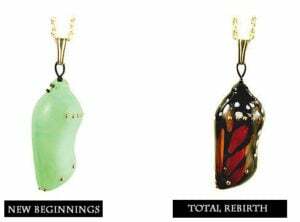 I’ve had cats pupate this way, and the chrysalides still end up hanging vertically. Butterflies were able to emerge normal and healthy. 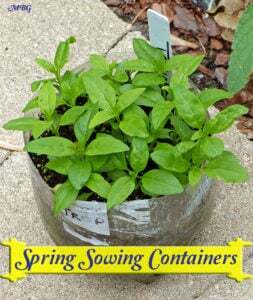 In the picture under tip #9, what kind of containers are the stem cuttings in and what size are they and do you know where a person would obtain them? I feel the mw tubes don’t hold enough water. Hi Pam, those are glad food storage containers and they come in 4oz. or 8oz. The floral tubes we use are 15ml. I don’t like the smaller ones because they run out of water too quickly. Thanks for all your info – I am learning so much! 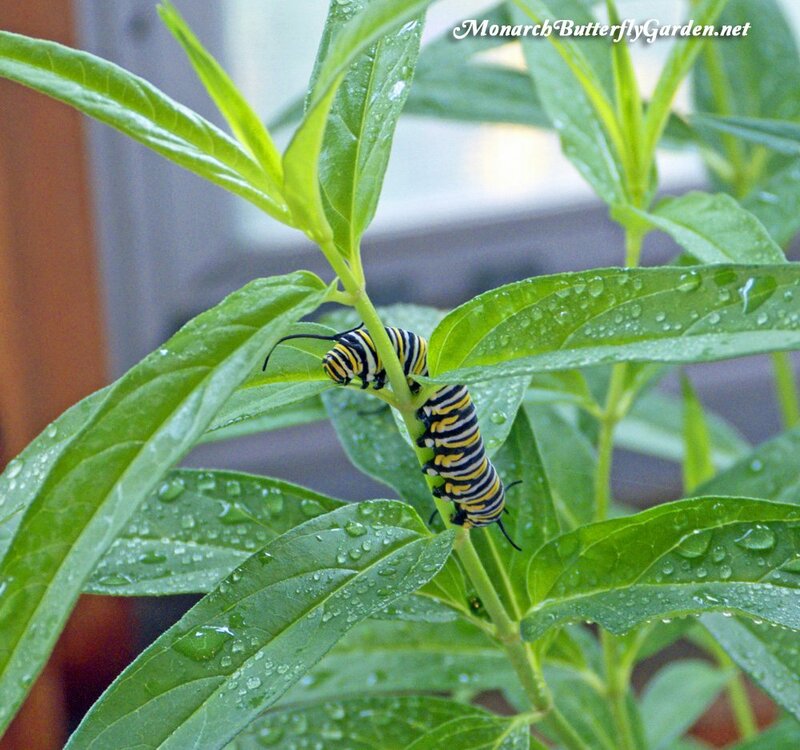 you’re welcome Laura…I hope the info here will help you to have a fantastic monarch season! I want to raise monarchs this year in your mesh cages as I lost a lot of baby caterpillars last year due to storms and (I think) birds. Would it be safe to place the mesh cages on an outdoor patio with a roof over it? Thank you. Hi Donna, you would need to put something heavy inside the cage so it wouldn’t blow away. Also are there large predators that would bother a cage outdoors? or smaller predators like mice that might chew through the cage? I can’t answer these questions, but they are points to consider before making your decision. We keep ours in a porch, where these aren’t potential issues. Last year I read some info about freezing milkweed leaves to keep on hand for emergency feeding. I had been pulling up the common milkweed since it was being so invasive in my garden. Once they grew to about 1-2 feet I dug it up, stripped the leaves (smaller are better), washed & dried them & placed them in layers of paper towel. I then placed them into gallon baggies & froze them. By October (the end of the season here) my cats had eaten everything available so I started pulling out the frozen common leaves, thawed them at room temperature & fed them to the cats. They ate them up & survived! That’s a great way to eliminate milkweed emergencies, especially since you’d be tossing out the dug up plants anyway. I also did something similar with milkweed leaves last year. I would pick them from my regular sources then bring them home. Then wash each leaf carefully and keep in the fridge in a plastic sealed container along with a damp paper towel. I took care of it like I would keep lettuce fresh. It stayed very nice fresh and moist. I released 76 Monarchs last season it was my first time doing so and loved it. I cut back my Milkweed last year and it came back incredible. I must have 3-4 times as much Milkweed now. Just waiting for the Monarchs to come. I use Styrofoam coffee cups with plastic lids, that I put a hole in for my indoor Milkweed or even McDonald or Starbucks cold coffee or soda cups with the plastic tops too. They work great for my indoor cuttings for the Monarch cats. Can’t wait for this season to start. I have seen a few Monarchs that I had raised during the winter come by so far. Thanks for all the information, I love your site. A couple months ago, I brought in about 25 cats over several weeks. Every single of them died while making the “J” — after getting big and fat and healthy looking. 3 or 4 made chrysallis but none emerged. I’ve never had this problem before. I thought that my milkweed had somehow gotten tainted with pesticides, even though it came from my yard. However, my mother and a friend gave me milkweed from their yards, and I also bought 7 plants from a non-spraying nursery. All cats who ate that milkweed died as well. So, now I’m wondering if there might have been something on my butterfly castles that killed them? They would have had to walk up the castle walls to make the J. I don’t spray harsh chemicals in my house, but had sprayed some non-toxic stuff for fleas on the carpet last year, and I may have used diotamaceous earth on the carpet in that room. Maybe it got on the walls of the castles that were folded up in the room? I don’t know. I’m grasping at straws at this point. What can I wash the castles with that will wash off whatever might have killed the cats, but won’t be toxic to them? (Even though most of my milkweed was eaten to the ground a few months ago, and is barely sprouting back out, I saw at least a dozen cats out in the garden last weekend. I’m afraid to bring these guys in for fear that whatever is wrong will kill these too). I raised the last bunch of cats on mostly cuttings from my yard or my mother’s and friend’s yards. None of us spray pesticides. I put whole potted milkweed plants in the castle, from the non-spraying nursery, when I ran out of milkweed and had several big fat cats left. I knew they would devour those plants in a day or so, so no use cutting. I never saw any caterpillars on the cage floor and I always put down a layer of papertowels to catch “stuff”. I’m guessing that the diotamaceous earth floated up on the sides of the castles, since they would have been in the room but folded up, when I put it on the carpet. Honestly, I don’t know. I’m just guessing since so many cats died from so many different milkweed cuttings or plants. The only constant was my castles. Just sickening to lose so many. I’ll soak my 2 caterpillars castles good before I try bringing anymore in. Seems like I always see at least 1 Monarch in my backyard year round, so I’m sure there will be more cats out there in no time. Hi Bett, if you already rinsed out and dried the castles, it’s hard to imagine there could be enough DE to cause a mass die off, but yes, try rinsing them out again, just in case. Keep us posted on your progress and good luck with your next monarchs! I have 40+ caterpillars at various stages, but most of them are 4th and 5th instar. This was unexpected. I’m running out of milkweed. They are eating the stems. And, an intense storm is passing through SoCal. It’s been very wet, cold and rainy. It also hailed several times today. The temp will drop tonight to the mid 40’s. The daytime temp for the next 3-days will be in the mid 60’s…then rain is expected again. Will they be okay? I can’t move them. Hi Michele, they are pretty tough so hopefully they can stay secured under leaves and ride out the storm. They can definitely survive Mid 40’s for a low temp. Perhaps you can plant some more milkweed seeds and plants when the storms let up…good luck! Hi, Tony – I am raising my first Monarchs of the season and have 2 cats that turned into chrysalids, but did not completely shed their skins. There is a black cap that is still attached at the top of the chrysalis where the webbing is. Will the butterfly still be able to eclose normally? The rest of my first batch (14 in all) are all normal and my first butterfly emerged today. Hi Lisa, if the skin and face back is just crumpled up at the top of the chrysalis, that’s not a problem. You can leave it there. If the caterpillar shed its skin only half way up the chrysalis, this means it died while forming it’s chrysalis. If the chrysalis is fully formed, it should be OK.
Hi Dale, it sounds like you have big plans for the season. Good luck with your spring planting! Great info. I have been doing this a couple of years. This spring was the first year I did not have to run out for emergency milkweed. I have released about 50 butterflies this week. I’m glad you mentioned separating cats by size. Those fatty fifth instars mow through whatever is in their eating path! Hi Tanya, it sounds like you had quite a successful season. Those milkweed emergencies can be stressful…glad to hear your garden is now keeping up with demand. I want to recommend butternut squash as a supplemental emergency food source for caterpillars. I cut the squash into pyramid shapes, hard rind down. That way there is plenty of surface area for cats to share space. Plus the poop falls off the slanted sides.